This Lee Enfield rifle also known as the SMLE Mk III, was introduced on January 26, 1907, and was chambered to fire the new Mk VII High Velocity spitzer .303 ammunition. The rifle on this page was manufactured in 1918 and the picture above was taken shortly after this rifle was removed from its shipping container. During the first World War, the SMLE Mk III was found to be too complicated to manufacture quickly. The demand for rifles was quickly outstripping supply. So in late 1915 the Mk III* was introduced which incorporated several changes to help speed up production. The most prominent of these changes was the deletion of the magazine cut-off, as well as the long range volley sights. 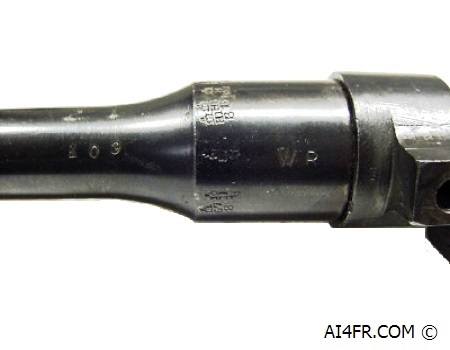 Other changes included the removal of the windage adjustment capability of the rear sight and the cocking piece was changed from a round knob to a simplified serrated slab. Rifles with just some or all of these changes in configurations can be found today. The reason being is that the changes were implemented at different times, in different factories, and were done as stocks of preexisting parts were used. Nothing was wasted in the war effort. An interesting note is that the magazine cut-off that was reinstated after WWI ended, was finally dispensed with entirely in 1942. The inability of the principal manufacturers which were, RSAF Enfield, Birmingham Small Arms, and London Small Arms, to meet the military production demands led to the development of the "peddled scheme", which contracted out the production of whole rifles and rifle components to several shell companies, leading to a minor political scandal. The SMLE Mk III* which was re-designated Rifle No.1 Mk III* in 1926 saw extensive service throughout World War II. 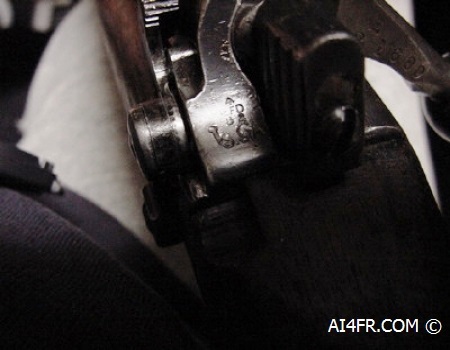 This rifle could be found in the hands of the allies in North African, Italy, the Pacific and Burmese theaters. Australia and India even retained and manufactured the SMLE Mk III* as their standard issue rifle during the war which was presumably due to the familiarity with the design and ease of production. This rifle remained in the Australian military service through the Korean War, until it was replaced by the L1A1 SLR in the late 1950s. The Lithgow Small Arms Factory finally ceased production of the SMLE Mk III* in 1953. These next two photographs show the barreled receiver with the stock and other components removed. 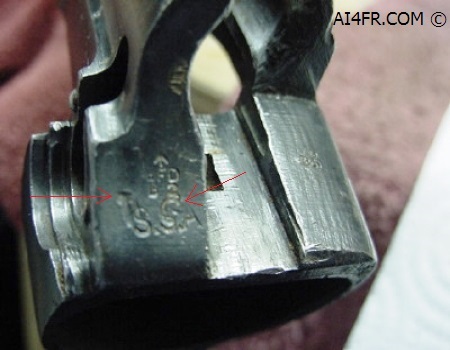 These pictures also show the many different manufacturer and/or arsenal markings that are found on these rifles. These next two pictures are of the rear of the receiver under different lighting conditions. This is done due to the fact that there is an W.G. stamp on the rear of this receiver that I have been unable to figure out its meaning. If you know what this marking means or even have some ideas, please send me an as I could greatly use your help on this one. The red arrow in the picture on the left is pointing to the top of the letter "W" while the arrow on the right is pointing to the top of the letter "G". 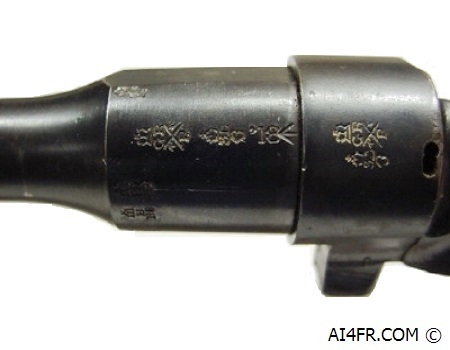 According to the Lee-Enfield rifle markings website located at http://home.earthlink.net/~smithkaia8/ the "W.G." stamp could indicate Welsh Guards.